Is Campbell Live Racist? ... That Al Nisbet Cartoon. Update 1 follows after post ... the answer. No, of course Campbell Live is not racist, albeit, I don't know that is the final point to take from the debate over the cartoon. Re the comments, and a couple of emails, of course I believe in unfettered free speech: I never took this as a free speech issue, no one has been asking for a law change to ban cartoons! The issue here was is this cartoon racist. For me the further issue is the breakfast in schools program that is growing dependence and the welfare/surveillance state. As a classical liberal, I can talk about racism because I can’t, by definition, be racist (or sexist, etc) ;) I deal with people on the level of the individual, thus not as stereotypes, or insentient representatives of a group - as, for example, this Marxist feminist ironically deals in. Okay, but then have a look at this clip on Campbell Live last night regarding the breakfast in schools scheme: have a very close look at every single child in it. I might be wrong, but I don’t see a single pakeha child: only Maori and Islander. And even if there is a pakeha I've missed, they are a minute minority. So my questions. Is the Campbell Live clip racist by only connecting non-pakeha children with this issue via dint of the children shown in their clip? If it's not, then what makes this cartoon racist? 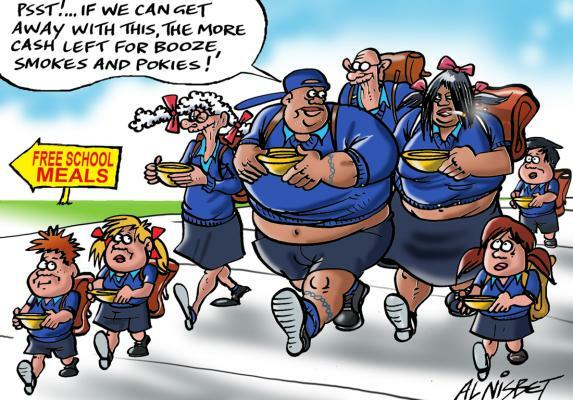 Note the sentiment of the cartoon might well be offensive, but the accusation is Nisbet is racist because he has only shown Maori in the cartoon. Surely before we put good old stick John Campbell before the squash player, given the strength of the hate earned by Al Nisbet, we need to understand the contradiction here. Regarding the breakfast in schools scheme, itself, given it sheets not one iota of responsibility onto the parents - regardless of their race - in the form of identifying those sending their children to school with no breakfast, and asking them why this is, (because in that lies the only actual fix); then this scheme is, of course, another travesty of welfare growing an already huge state by creating yet more dependency. We're not just feeding those children who are being sent to school with no breakfast, we're feeding every child in New Zealand attending a primary school: who can't see where that leads? Then think of the further logic behind this scheme: these parents can’t, apparently, provide breakfast for their children. Okay, so why isn’t the taxpayer also providing their lunch, and packing them with tea to take home? Surely we should just be feeding these children, period? And what about clothing them? Indeed, if parents are this hopeless, then shouldn't we do away with families, and just have the state raise our children in total? This is exactly the same issue as to the (unintended) consequences of renovating and building bigger state houses, as I have written on earlier. Freedom and the free society. No point looking here: it’s gone, lost to rampant statism. Because what pays for all this is tax; and the tax system is Orwell’s vision of the surveillance state, my entire blog is proof of this. To the parents, and I couldn't care less your race; if you can’t afford to feed children, then please, don’t have them. Childbirth is not mandatory. That'll teach me. The answer to the first part is below: and I simply needed to rearrange the words in my first paragraph to find it. A wise man, or in this case, woman, might even conclude a bit of ... let's say a lapse, rather than rank stupidity on my behalf. I was going to take this post down, but that would be somehow cowardly, plus across 160 posts, I'm allowed to err this once :) And related, the way this debate was framed in the MSM, and via too many journos on Twitter, I wonder how many did in fact get it, because until Gina, I was only getting single word denunciations of my proposition, that is, no explanation? Plus the issue also stupidly devolved into another 'get Devoy' agenda on Twitter, which is counter productive as it takes the mind from the issue that matters - why, in New Zealand, 2013, is any child being sent to school hungry. Per my blog above, the second part, my answer is different to what the Left imputes (erroneously). And anyway, that said, my post was also deliberately written to throw a second rotten egg into the debate on racism and this cartoon, but in a manner than could not put the yoke back on me, because it is deeply uncomfortable - that issue's still there, regardless of the above explanation, in those two questions, and the content of the Campbell Live Clip: but for once, I'm not going there - and no one else can, there is no data. Political commentator, Bryce Edwards, points to this again in his summation of this post on his political round-up: see update two following. For the record, yes, this cartoon is racist. And we'll put this down to the clumsiest post I've written. Marvellous: my clumsiest post to date, and I finally make Bryce Edwards Political Roundup :) The lot of a blogger. 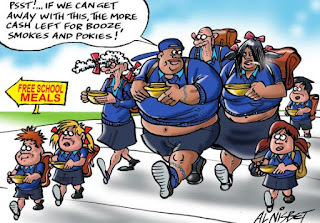 Libertarian blogger Mark Hubbard argues that 'the sentiment of the cartoon might well be offensive, but the accusation is Nisbet is racist because he has only shown Maori in the cartoon', and this is unwarranted because clearly many of those using food in schools are indeed non-Pakeha, as evidence by a TV clip - see: Is Campbell Live Racist? ... That Al Nisbet Cartoon. Fortress of Legislation Has Regulated Another Industry to Death: Financial Advisers. AFA’s, or AFG’s, or GHE’s, or ABC’s, perhaps GOD's? Oh, whatever, so many confusing acronyms over time: financial advisers. On the regulatory death of free speech under our draconian securities legislation, there is now a dearth of financial advisers. That and the Fortress has legislated so many hoops to jump through in this industry, nobody can be bothered doing so anymore (paid link). “It’s more of a gut feel of just looking at the maths and anecdotal feedback from discussions with the industry and how the limited number of AFAs are now needing to prioritise the personalised advice they provide,” he says. Mr Ireland notes some of the AFAs do not even deal with KiwiSaver, particularly not for those with small balances. Other advisers are qualified and capable of becoming AFAs but do not do so because they don’t consider the benefits worth the extra cost and compliance burden. Our securities law regulates everything right down to free speech - that is, there is none - and then we wonder why there are no advisers. Given the risk faced in advising under NZ securities law, I wouldn't trust any adviser doing so, as they would by definition not be prudent. Indeed, more and more, I don't know why prudent people would take the risk to build the companies to invest in, to be advised on. A little over four million total population and so many laws: what a farcical kindy of a country we are. For the record: I didn't vote for it. State Housing – Is There Any Better Example of What Is Wrong With The Welfare State? I’ve not kept up with National’s intentions for state housing: I’m finding tuning into the activities of government depressing and so am less inclined to do so, opting for nice stuff instead, like drinking wine. Although, of course, it is impossible, ultimately, to stick one’s head in the sand, because the state owns us, I know this when I look at our tax liability for the coming year that I’ve just calculated, on which Mrs H is furious, because it means the prudent curtailing of some of our plans; that is, a word increasingly unknown to the welfare state: restraint. Let me explain. I realise that all current residents of state housing are to be assessed as to their fitting the requirements for state housing, and all the normal hubbaloo is sounding from those statists who have forgotten that a state house was never supposed to be for life: it was a step up, a temporary helping hand. So faint praise from me on this one. However, as with so much from this government, it appears to me there is a doublespeak involved. Just as Bill English’s constant references to spending constraints in reality mean not having to deal with what is really necessary, spending cuts, and hiding the fact that his every budget has increased the total government dollar spend, so do I see the lie of the state house occupier reassessment. The lie is in the fact the government is embarking on vastly increasing the stock of state houses: not just the number, but the size per house, to four and five bedroom houses; additional bedrooms being renovated onto existing state houses. Free men know that add bedrooms and build bigger state houses, then welfare will surely fill those bedrooms with babies, who in most cases I would hope have love – though certainly not guaranteed – but much less chances in life, than those born of love, affection, and prudence: welfare is doing what it does best – creating a permanent struggling underclass. This insight into the doublespeak was gleaned by myself from a two minute clip on the TV 1 six o’clock news this last Thursday night, 16 May. It was discussing the need for bigger state houses, and the camera panned to the problem: a mum – a dad was not present or spoken of, but whether this was a solo mum, or not, is beside the point, which is unrestrained irresponsibility and stupidity – ... a mum, who to me looked younger than 20 years old, until the evidence of her five, yes five, children on the couch beside her, tucking into potato chips, led me to believe she must I guess/hope be in her mid-twenties; anyway, mum wasn’t so much explaining the need for a bigger state house due to the brood of five, but, sit tight – something mum should have done much more of – it wasn’t just the five children next to her, as she went onto say, rather the eight, EIGHT, children family she has, and an additional one on the way because mum was pregnant again. Apparently, despite she could not afford her own housing for the existing family of eight, she’d made the decision to have another. Honest; watch this nonsense, though make sure, first, you’ve nothing precious and breakable around you. Although as bad as that is, and monumental stupidity on this scale is beyond my comprehension, it still was not the bit that really had me angry. On the arm of the chair mum was sitting on, was a Sky TV remote control. Now as regards that remote, here’s an interesting anecdote. I had two clients last year post their Sky remotes back, because they couldn’t responsibly – big word that – afford their subscriptions. Both clients are self-employed, one in the trades, the other a rural contractor; one with two children, the other with one, and both pay tax; their problem being after paying tax they're struggling. These two families are paying tax so mum of eight – nine to be – can move to a bigger house with her Sky decoder, and she's the one on the telly complaining about her lot, that the politicians from all parties in our Parliament are pandering to. There is nothing right about that. Nothing at all. For myself, partly because I keep this site, and I’m rightly terrified of IRD, I prudently do my taxes conservatively, or as best I can with our mish mash mess of complicated tax law, hence Mrs H is not best pleased with our tax bills coming this year – (aside: I see the IRD tracking through my blog (see update 1) and so remind all officers to read my disclaimer at bottom, please, especially in this age when the IRD has broadened its reign of terror to advisors.) Although our problem is a little more complex than that: I’ve had about as much as I can take of social(alist) democracy – read funding mum of eight with ninth on the way - but have resigned myself to the fact this train we’re on to the state gulag is unstoppable, so I want to take more time out to look at the scenery on the way, and do my own ‘thang’. Thus, with only Mrs H and myself to look after any longer, and we can live pretty cheap - our biggest budget item is wine - I’ve been asking some of my bigger clients to leave so I can trade money for time - I've never been driven by money. The way our tax system works this means paying tax bills from higher income years, on smaller income, which is not a problem as we have it put aside, we plan, though is an inconvenience in that I have to look to estimating provisional tax. And within this context we have been spending just a tad too much, for reasons that are personal, and stuck with an earthquake damaged house in Christchurch not helpful, so, as I wrote at the start of this, we’re employing a little necessary restraint, so as not to have to use our long term savings. And all that would be fine, or rather would have been, if it wasn’t for mum of eight – ninth coming - on Thursday night. Her complete seeming disregard for restraint is just rubbing my nose in how unjust this prison of state known as the welfare state, has become. I’ve said before, the problem is not welfare abuse: it’s welfare use which is, of course, the end of the free society, and the road to a cruel one. And a final note in passing, a personal one, if this is the caring society, then as one of those paying for it at the price of my privacy and right to be left alone, and mine and Mrs H's goals and aspirations, sorry, I ain’t feeling the love, and mum of eight – ninth coming – is feeling, and getting it far too much: has she heard of birth control? If the wine world hadn’t moved to screw tops, I could’ve sent her a cork. Finally, just for those caring politicians who don’t understand our Western tradition of classical liberalism, no, the ANZAC’s didn’t die for this unrestrained, irresponsible, behaviour politicians use to bind the prudent to the yoke of them, either. Far from it - this is what war hero Charles Upham was fighting for. Um, unrelated addendum: I don’t want to depress the workers too much more, but in case you hadn’t noticed, the government money printing presses have been working incessantly, world-wide, to ensure the next economic collapse is much deeper and more thorough than the last one starting – and still going – since August, 2008. The markets are going to collapse again – why, because the fix for that financial crisis implemented by the state planners, was simply much more of what caused it: (just quietly, another reason to hunker down and take stock) … [Lights fade to maniacal laughter). With that, Mrs H and I are entering the last couple of weeks of our break, with friends descending on us tomorrow and staying for a while, so posting may be intermittent until we get back to Geraldine.